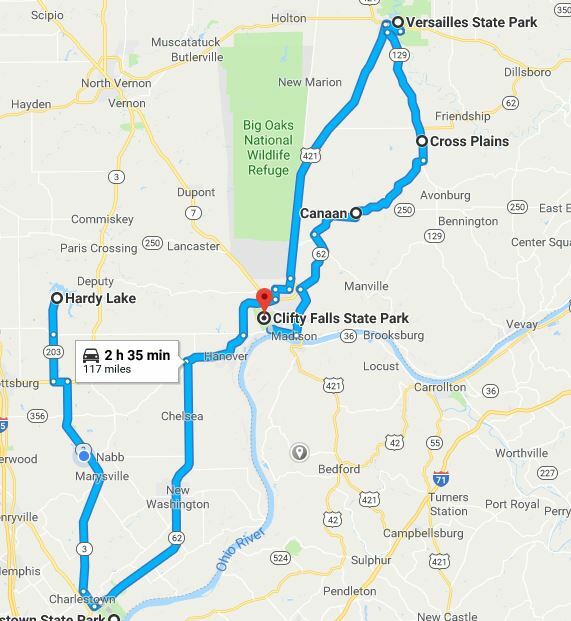 The perfect motorcycle ride: four Indiana State Parks and the routes between them. At each park the riders participated in fund raising activities put on by that park’s Friend’s Group. Friends Groups are non-profit organizations whose sole purpose is the preservation and support of that park. 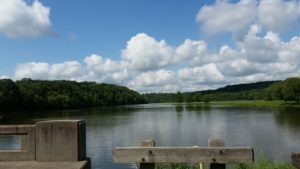 A Friends Group provides a unique support system for Department of Natural Resources, DNR, properties. Members are people who love our parks and reservoirs and want to help keep them healthy for future generations. Friends group volunteers help with events, work on trails, conduct fundraisers for specific projects and offer other financial support for the purchase of equipment, supplies or other materials as needed. In the process, the people who belong to these groups meet new people, have opportunities to learn and grow and gain the satisfaction of helping support our sites. 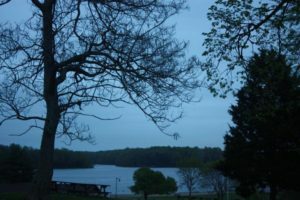 The ride started at Hardy Lake for a great breakfast from 7 AM to 10 AM and with sign-in and a goody bag for each rider/passenger. The breakfast* is all-you-can-eat. The Hardy Lake Friends Group supports the Dwight Chamberlain raptor center located on the property. All proceeds go to the support of the raptor center. 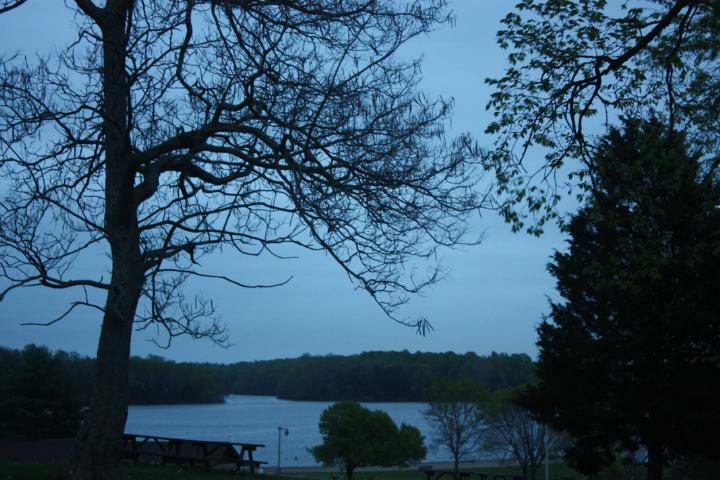 For information on the breakfast, including this year’s schedule go to Hardy Lake Breakfast. From Hardy Lake the riders went to Charlestown State Park where they took an unforgettable ride back in time and visited one of Southern Indiana’s historic hot spots along the Ohio River during its heyday in the 1920s, Rose Island amusement park. Normally limited to pedestrian traffic, the riders traveled down the steep hill (approximately 200 ft. of elevation change) turning sharp left and crossing 14-mile creek by way of the historic Portersville Bridge. 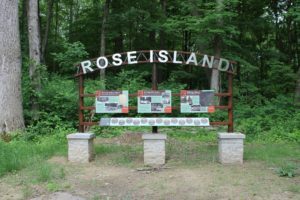 While at the bottom, they took a break and stretched their legs as Friends members explained the history of Rose Island. Visitors took advantage of a very special photo* opportunity with on their bikes at the Rose Island entrance sign. From Charlestown the rides was to Versailles State Park for a poker run* totally contained within the park. It started at the main gate and poker hands were gathered for the grand prize. The winner is shown in the photo gallery. 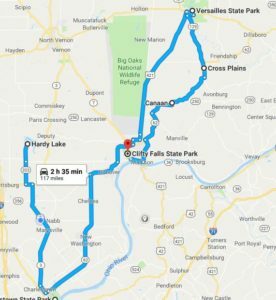 The ride finished at Clifty Falls State Park with a scenic drive through Clifty Falls State Park where four breathtaking waterfalls are just a quick walk from your bike at each of the three marked locations. Then everyone enjoyed an evening of good food, fun games, and relaxation after a long day on the road. *What was included in ticket price: Breakfast, Souvenir Photo, Poker Run, and Hog Roast. If the ride sounds good, keep checking this site for next year’s addition. Probably posted early in 2019. 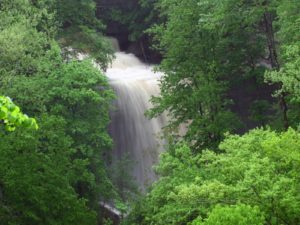 This site is not published or managed by the Indiana Department of Natural Resources.